Gladys Alean Wright, age 94, of El Dorado Springs, MO, passed away February 1, 2017, in Dickinson, TX. 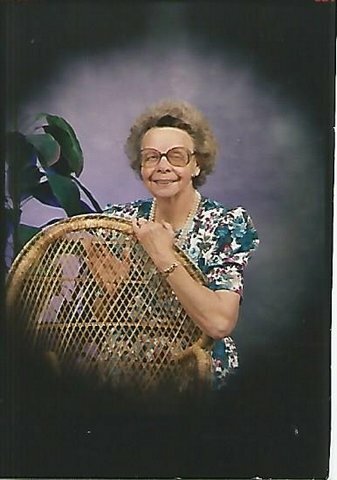 She was born February 22, 1922, in Cedar County, MO, to Art Hicks and Ruth Elizabeth (Pike) Hicks. She graduated El Dorado Springs High School in 1941. Preceding Alean in death were her first husband Lonnie Mast; her husband, Jim Wright in 2010; one brother, Clarence Hicks; two sisters, Grace Morton and Artie Floyd; one half-sister, Ruby Olden; and a granddaughter, Mary Tally (little Mary). Survivors include two sons: Donnie Mast of El Sobrante, CA and Lonnie Mast and wife Linda of Wichita, KS; seven grandchildren: Lonnie Mast III, Anthony Mast, Vonda Turner, Davon Sutton, Vauneta Warwick, Curtis Mast and Wesley Mast; seventeen great-grandchildren; thirty-two great-great-grandchildren; five children: Olive Tally, Stella Miller, Matthew Wright, Clifford Wright, and James Wright; one brother, Lawrence Hicks (Delores-deceased) of El Dorado Springs, MO, and his adult children, Lawrence Lee Hicks, Doug Hicks (Sue), and Joyce Wallace, Shirley Vickers (Gary), Carol Girven (Greg), Janet Hicks (Oscar), Cheryl Layton and Brenda Parsley (Bill), affectionately called The Hicksie Chicks. She is also survived by numerous nieces, nephews, great and great-great nieces and nephews whom she loved dearly. Funeral services for Gladys Alean Wright will be held on Wednesday, February 8, 2017, at11:00 a.m. at Bland-Hackleman Funeral Home. The family will receive friends from 10:00 a.m. until service time. Interment will follow in the El Dorado Springs City Cemetery under the direction of Bland-Hackleman Funeral Home. Pallbearers are: Tony Mast, Curtis Mast, Brent Mast, Phillip Mast, Devon Petersheim, and Corey Johnson.